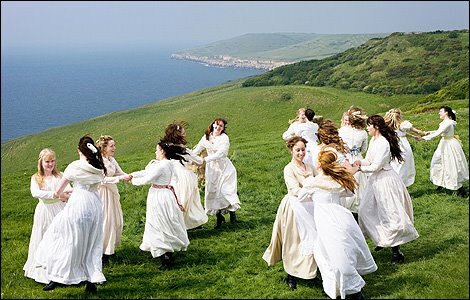 ‘Wessex’ theme: think Tess of the d’Urbervilles with Angel Clare (in the white dress, not at Stonehenge), bunting, daisies and sweet peas in jam jars, folk music, Kate Rusby, sparkly wine. Cream teas after the ceremony, during photos? As pudding after main meal? Blue and white stripy cake, like UN-birthday cake, with butter icing and blue sugar flowers/blue check ribbon. Thinking of whittling some wood and making a version of these personalised cake toppers. We’re tying the knot as well. When is your date? That sounds absolutely lovely! Have a fantastic time organising it all. This post is intended for me to whack my links into as I have a habit of seeing things I love online and then losing them. How wonderful! Sounds like its going to be gorgeous. I love that u r doing cream tea. I guess somebody is going to be very busy in the upcoming months!